Never in a million years did this hot-weather-loving bikini-wearing Trini girl think that she would one day travel all the way to the wilderness of Alaska, and if it were not for my husband I never would have had the inclination or the opportunity to even try. 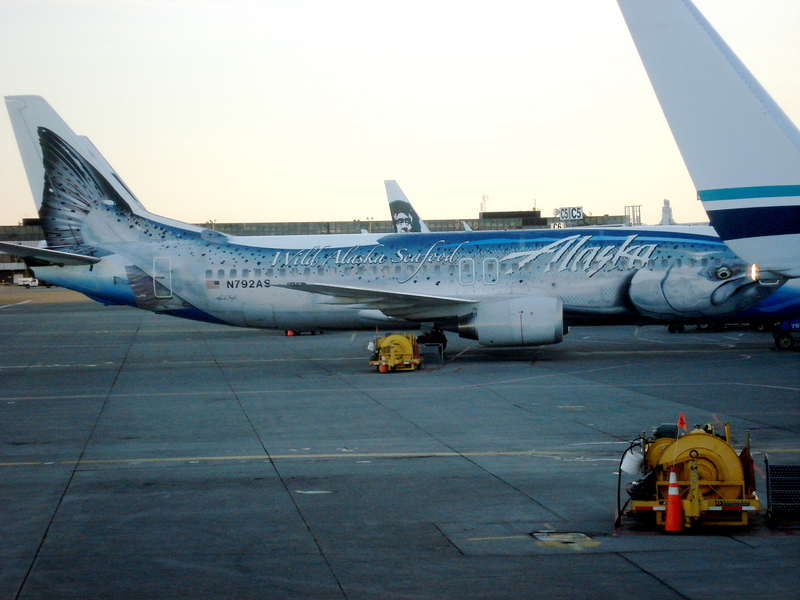 Every year for the past seven years he has made his sacred pilgrimage to Alaska to try to catch some wild salmon, and usually comes back home with a suitcase full of fish which I quickly insert into my stomach. Even though I am not a fisherwoman myself, and don’t know jack about fishing, I have to admit that freshly caught wild Alaskan salmon is incredibly delicious, so I thought it only fair that I should at least try my hand at catching them myself…. Our journey began in Anchorage, where we stayed the night at the house of an old Japanese lady who runs an unofficial B&B in her home to make some extra coin. I don’t blame her — I can’t imagine how anyone makes money in Alaska unless you work in fishing or oil. But it was great; she even packed us up some bento boxes (a Japanese style lunch box) with onigiri (rice balls) and lots of yummy goodness, and we were on our way the next morning. 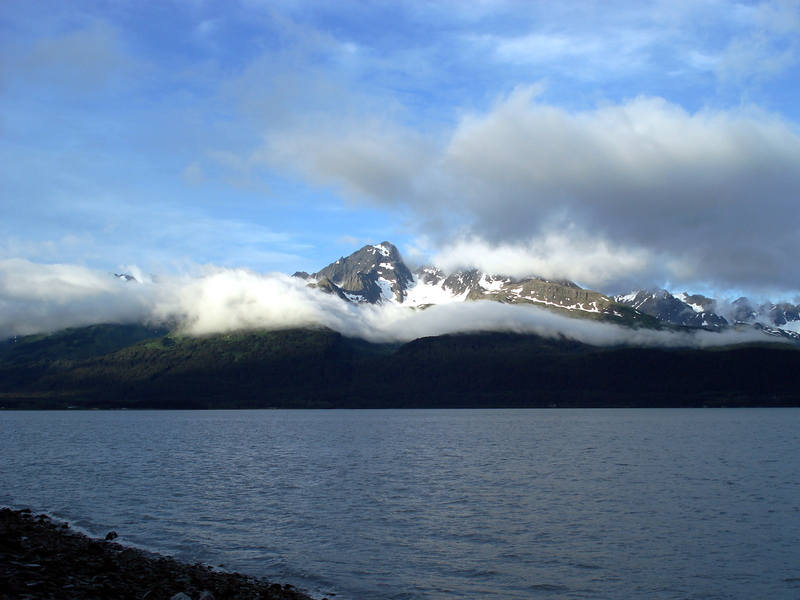 We drove south to the coast towards the town of Seward. Despite the greyish weather, the drive was breathtaking. No matter where you look you see snow-capped mountains, blue glaciers, crystal clear rivers. As we passed over the Kenai River I was amazed by the strange milky blue colour of the water, which comes from the glacier. I’ve seen a lot of beautiful rivers and beaches and mountains in my life, but nothing like this before. It was a really unique colour. 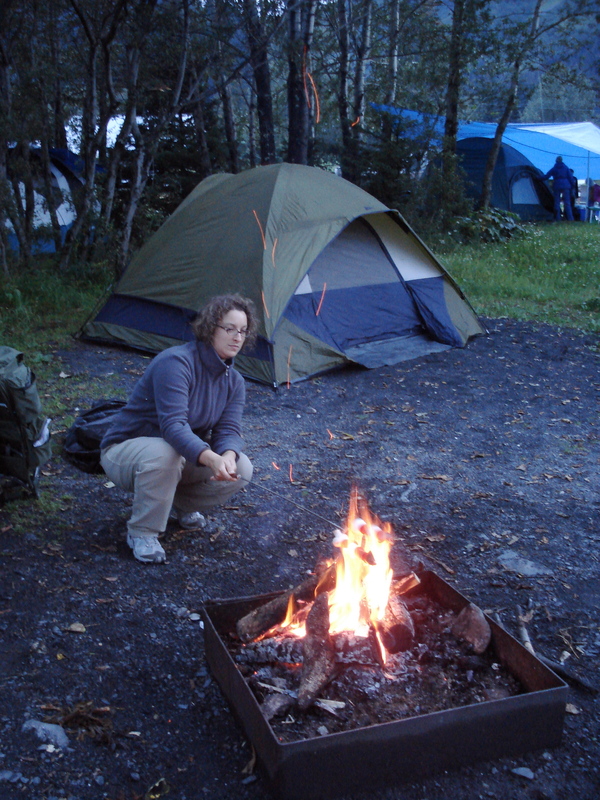 In Seward we did two nights of camping — my first time to really camp out. The weather unfortunately was uncooperative and drizzly at times, but it was great fun setting up our camp at the beachfront. The public campgrounds and surprisingly well organised, with clean toilets, running water, and for $2 you can even take a hot shower. Not too bad for roughing it. We set up our tent and tried our damndest to get the fire going. It was obvious to the other campers nearby that we were city slickers, so one of them very kindly came across to lend us his axe so we could cut the firewood into smaller pieces. Finally we got the fire up, and sat down to drink a cold Alaskan Amber beer and enjoy the view across the bay of majestic mountains and glaciers. We often saw a lone sea otter swimming around the bay. The temperature dropped quite a lot overnight which left us shivering in our sleeping bags. Camping was a lot of fun, but I hope the next time I do it, the weather will be a bit warmer and sunnier! 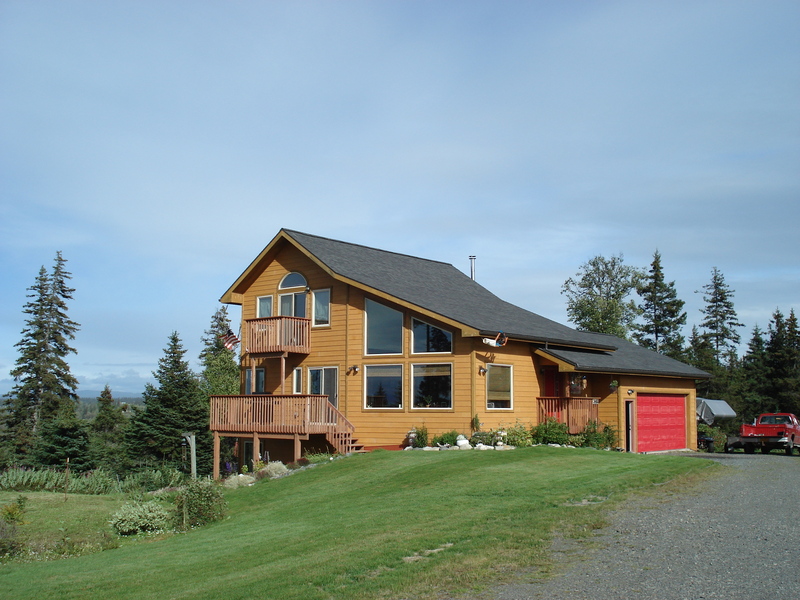 After two days in Seward, I was definitely looking forward to getting to our next stop where we would stay for a week, at the beautiful Sheridan home in Anchor Point, close to the town of Homer. 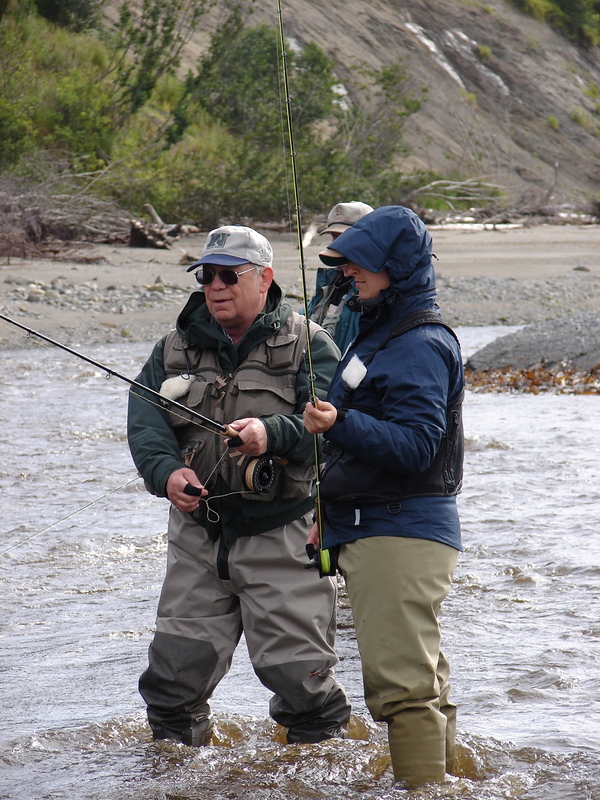 Gary and Eileen Sheridan are old friends of Seiji’s, having met each other many years ago on the Anchor River where they go fishing. I think their home is one of the most beautiful I have ever seen. Lots of wide open space, lush forests, and a million dollar view across the bay, with 30 miles of visibility to the stunning volcanoes of Mt. Redoubt and Mt. Iliamna. In the evenings the sunset lights up the icy blue glaciers and paint the sky. 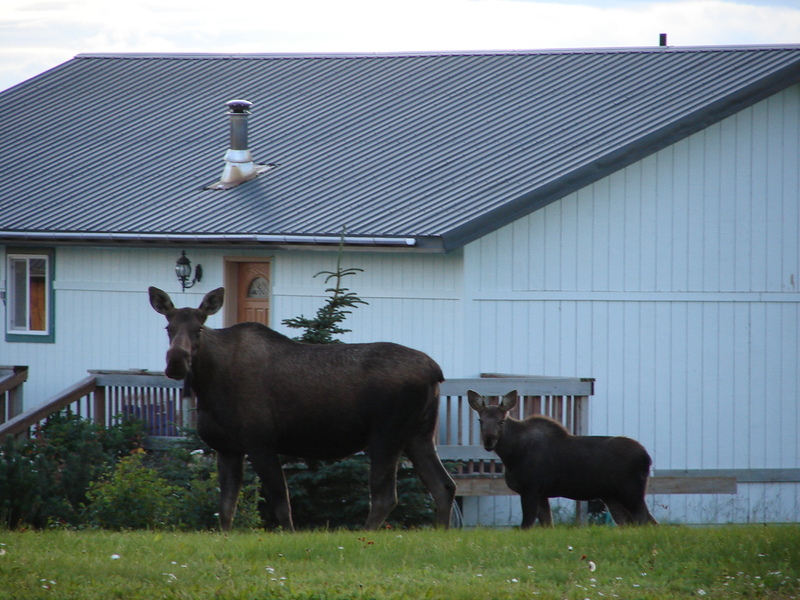 One night a huge mother moose and her two babies ambled through the garden, munching on berries. Life in Alaska is certainly one that is closer to nature. Other than the neighborhood moose there are also bald eagles nesting in the trees. We were told that you can sometimes see groups of whales swimming in the bay below. And there are, of course, a lot of bears too. Thankfully I did not see any of them myself. I can see now why everyone in Alaska has at least one firearm. It’s not that they are trigger happy. The gun is for protection. In Alaska humans are not on the top of the food chain and you have to be prepared if you go into the forest. Bears also come by homes looking for food. And considering how big and powerful they are, you better have something big and powerful yourself. As for the fishing — it proved a lot more difficult than I imagined. At Wal Mart we bought our fishing license and picked up the tide tables. It takes careful planning to know where and when to go fishing. If you time it wrong you may miss out on the run. But even with careful planning, there is no guarantee that fish will bite your line. Gay trying to untangle my line, again!! On the first morning we awoke at 4.45 to get to the fishing spot for the 5.15 rising tide. Despite the sleepiness and jet lag, I was excited to try my first Alaskan fly fishing. 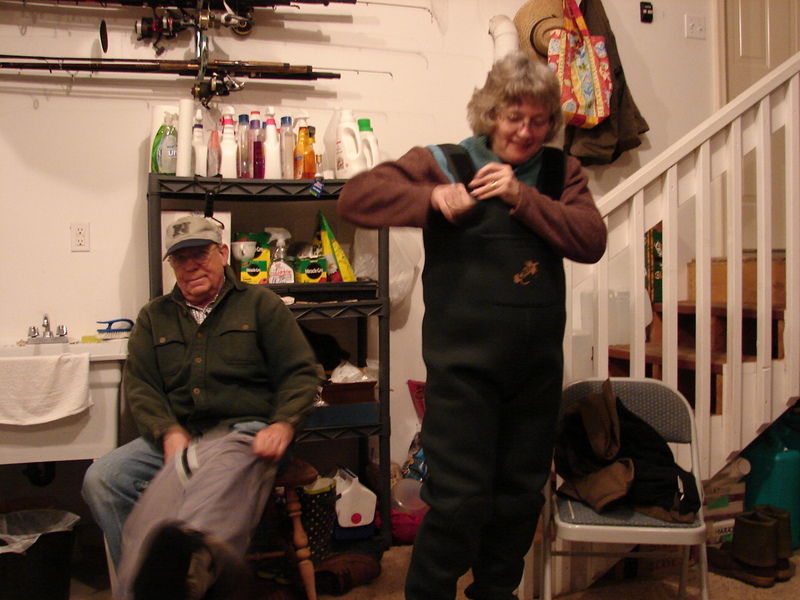 Wearing long johns, ski pants, and fishing waders, we were prepared for the cold darkness of the morning. We waddled quietly down the path to the river, using flashlights as our guide. 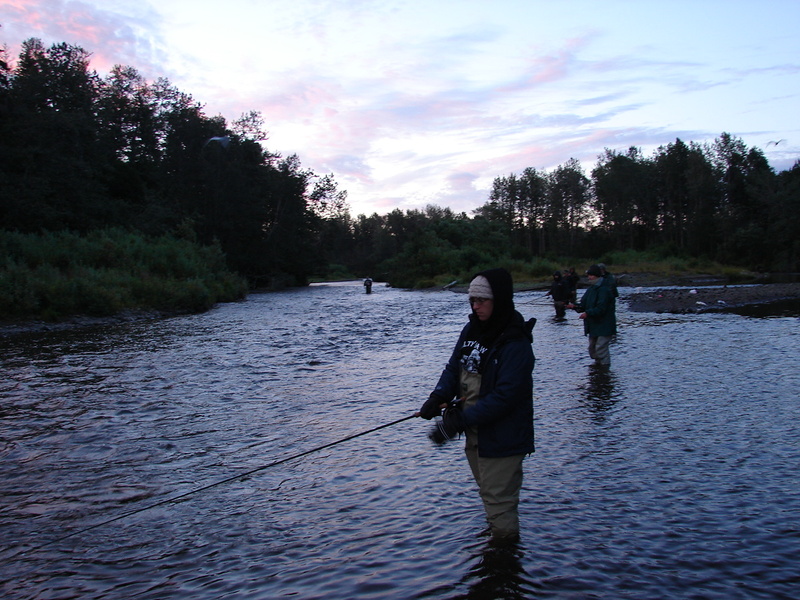 At the river bed, we arrived at the scene to find another seven or eight anglers, all standing in solemn silence, casting their lines into the water. We eyed up the location, and after giving each other enough space, began casting too. Cast out, reel in. Cast out, reel in. The tide was rising and the water was changing. Suddenly the people around us began catching fish. ‘Fish on!’ someone would call, and everyone would reel in to make sure they didn’t get tangled up. Everyone also stopped what they were doing to watch and see how big the fish was that he was reeling in. And watching them pull those big beauties out of the water definitely made you want to catch one yourself. One of my favourite memories of the trip was standing in the river, my feet damn near frozen, getting absolutely no bites, when suddenly next to me Seiji got a fish on, and it was a big one. Anybody who has met Seiji knows has a flair for the dramatic. The fish took his line and ran with it, and Seiji followed in hot pursuit. He ducked under the next guy’s line with a polite ‘excuse me’, and followed the salmon a good way up the river to the other side of the bank. As he ran through the water the other anglers around me chuckled and shook their heads. ‘Now where’s he goin’ with that fish?’ one guy said. ‘I dunno,’ another laughed, ‘it’s like he’s takin’ that fish for a walk.’ I smiled to myself, knowing that this is what he lives for. And now I can understand why. The scene was quite surreal — the angler dancing with the salmon through the water, the sunrise sprinkling pink and orange hues into the sky, all in front of the backdrop of a huge snow-capped volcano in the distance. I can see why anglers return to Alaska again and again. It is a hard place to beat when it comes to natural beauty. Unbelievably, I caught a grand total of zero salmon! Seiji caught just two himself, so I did not feel too bad, considering that he is the fishing maestro. Everywhere we went people on the river banks would walk around and chat with the other anglers. ‘How’s the catch today?’ they would ask. A lot of people were complaining about the low numbers of salmon this year. Apparently we were not the only ones with no luck. Thankfully, one of the neighbors, Jim and Sue from Florida, had a nice little boat and offered to take us out deep-sea halibut fishing. Six of us went out that day, all of them retirees, except for myself and Seiji, and all in good shape and living life to the fullest. The oldest guy on the boat was Fred, an 88-year-old ex-commercial fisherman from BC who drives his RV from Canada to Alaska every summer with his Québécois wife. We launched the boat at the Homer Spit, and headed a good hour and a half away from the shore. When we got to our spot we dropped anchor and got ready with the bait. Now, before I get into the halibut fishing itself, I want to mention one sort of a side story about interesting cultural differences between North America and Asia when it comes to fishing and eating fish. 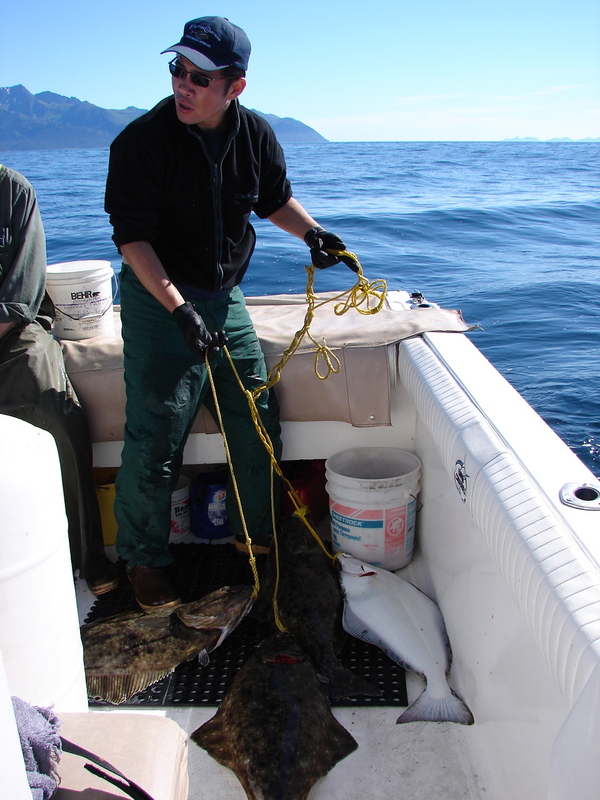 When we got on the boat, I peeked into the bait bucket, and saw much to my surprise that we were using salmon belly for bait. I was absolutely shocked… salmon belly… for bait! Delicious, juicy, yummy looking salmon belly, to catch halibut! Salmon belly, which in Tokyo is considered a delicacy! In Japan, usually the fattiest part of a fish is the most valuable. And here we were, using beautiful salmon for bait! It made me realise how Japanized I have become!! 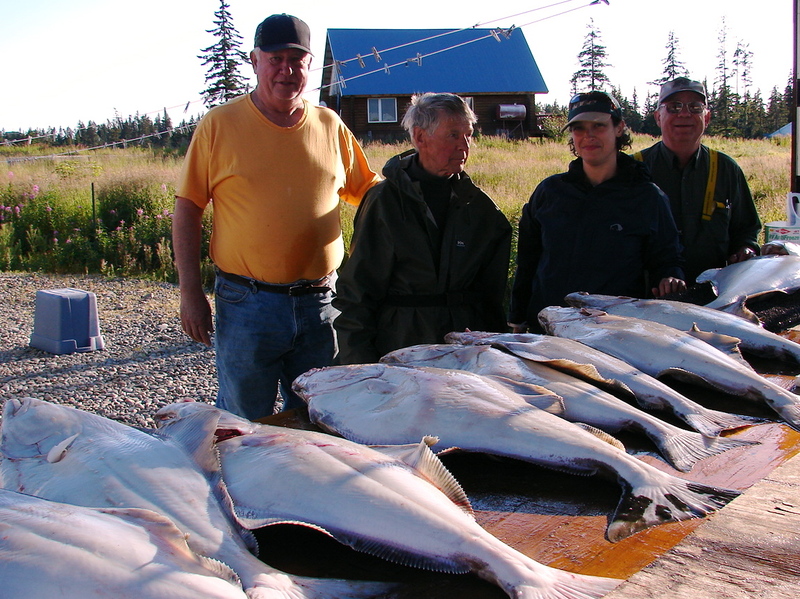 Anyways, the halibut fishing was an easy success. Almost too easy, in fact. The second you dropped the line and it touched the bottom, wham! Fish on, reel ’em up! We each caught two and they were a decent size, though I have seen pictures of people who have caught 150 lb halibut as big as a man. Unfortunately the seas were rocking and I felt really queasy the entire time. 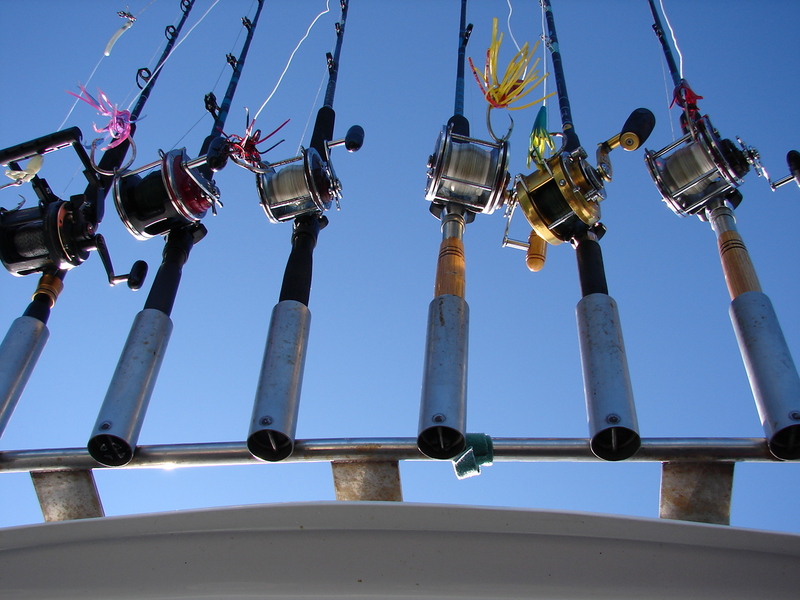 Looking up at the distance was all right, but the second I looked down at my reel I felt seasick. Once I caught my two halibut, I sat down and tried to control my upchuck reflex. It’s the most seasick I’ve ever been in my life. After the halibut fishing, we got back to Jim and Sue’s place and began cleaning the fish, and Seiji asked to keep the bones and the head, because in Japan the meat around the bones is considered to be quite succulent. They gave us a funny look, but gladly passed them over. Seiji showed me how to carefully remove the meat areas around the spine and the fins as well as the halibut cheek — a nice plump little piece of meat like an oyster — and later that night we roasted the bones and flaked all the meat off of it. You would be amazed how much meat you can get from the skeleton of a fish if you take the time. What a strange hybrid I have become. The Trini girl who knows how to remove fish bones with chopsticks and carve up a halibut cheek….. Guess this will get us through the winter! Beautiful post. So glad Mama moose came up while you were here. We miss you lots. So glad your trip was so enjoyable, and we’ll be smoking some of the salmon belly. Gary and I drove up to Soldotna. We met Amy and Don(friends from the valley Seiji has met) he and Don played golf there, while Amy and I drove back to enjoy an afternoon on the deck with a glass of wine and enjoying the view discussing the idea we could be out there as it rained most of the summer. How did you get such great pictures when I know you experienced one of our summers of rain and we are now having a few beautiful fall days. The birch trees are slowly turning yellow, the fireweed has lost it blooms and turning red. But, the sun is out and believe it or not it reached 73 degrees today with a clear blue sky after raining all morning. The sun is shining on the inlet and on Gary’s face as he is eating a snack at the table. Looking forward to you posting your new experience in “Land of 1000 Smiles”. Glad you had an awesome trip and great to read all about it. We WISH we could return and have another 10 days too but, alas, we have to put up with fishing only for snapper, Kingfish, Tarakahi, Kawahai and heaps of other varieties about once every two weeks!!!! Yeah, Summer is comming and the fishing will be picking up – can’t wait. I am so glad to see that you both had a great time with my best friends in Alaska. Gary and my husband Harold where childhood buddies and Gary and I graduated together from high school. Of course Eileen is one of my favorite gal friends. Wish we could of lived closer but at least this way i get to travel to see them. 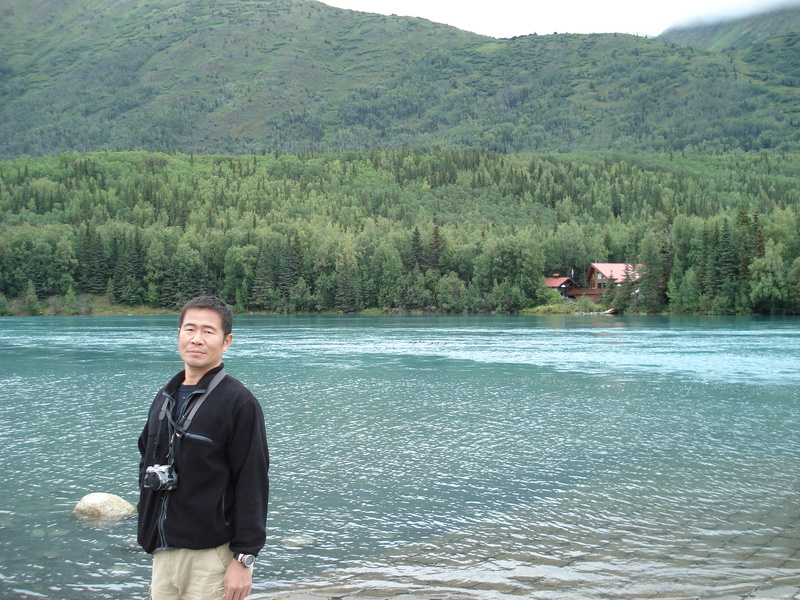 I had met Seiji a few years back when I was up visiting and doing my hand at fishing in the river below the house. I see that you both did much better then I but that is the name of the game. I hope one day I will be able to see and meet both of you on one of your return trips when I am also there to catch some big one.